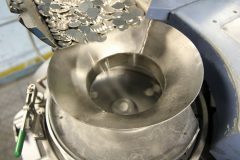 This fifth article in a series about our visit to the U.S. Mint at Philadelphia offers information, photos and a few short videos on how coins are produced for circulation. It took coiners in Colonial Philadelphia three years to strike the first 1 million coins, and they worked 11 hours a day, 6 days a week. 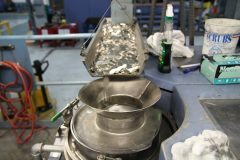 Today the men and women at the Philadelphia Mint can churn out 1 million coins in 30 minutes, with more than 4 billion coins already produced this year. How do they do it? It takes a dedicated group of people, modern technology and a city block of working space. 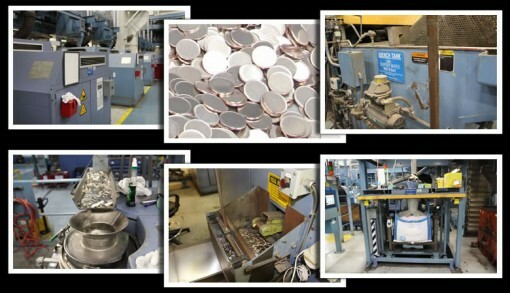 Photos and videos below offer far more detail, but first, here are a few summary paragraphs describing how the Philadelphia Mint makes coins for circulation. In the blanking stage, 6,000-pound coils of thin metal are fed through an enormous 25′ long x 10′ wide x over 16′ high blanking press to punch out metal discs called blanks. These blanks are too hard and brittle to become coins so they get sucked into colossal annealing furnaces for both softening and strengthening. The furnaces are impressive. Each of them can move approximately 3,000 pounds of blanks per hour. If they are quarter blanks, that’s 240,000 per hour — which will become $60,000.00. After heating, blanks are dropped into a huge quenching tank for cooling and then fed through a large spinning tube called a whirlaway for transfer to washers that remove tarnish imparted by the furnace stage. 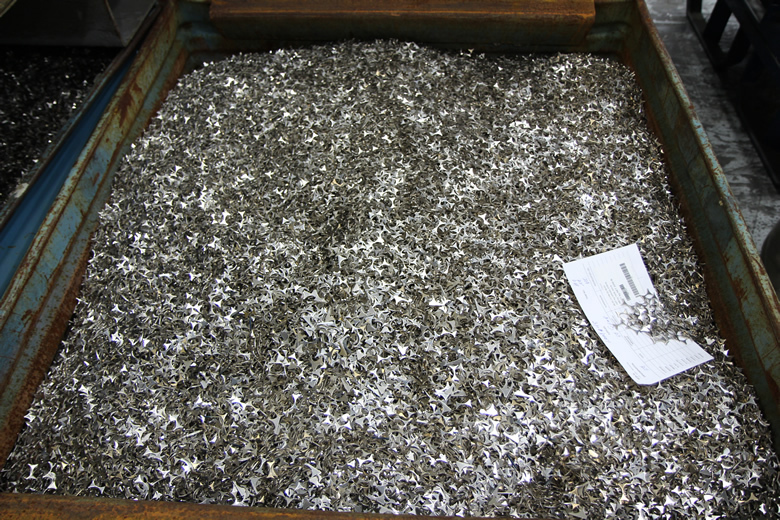 Blanks get cleaned, shined and dried before tumbling into an upsetting machine to get pinched for rims to inherit a new name, planchets. From this point, conveyors take the planchets and drop them into coining presses with mounted obverse and reverse coin dies. For circulating coin production, the reverse or "tails side" die is the stationary anvil and the obverse or "heads side" die is the moving hammer (as seen in a later video). A planchet is fed between the two and the press applies tons of pressure to transfer the designs — 35 tons for cents and dimes, 50 tons for nickels, 60 tons for quarters, 120 tons for half-dollars and 85 tons for dollar coins. At a reference point in the Mint’s public tour 40 feet above the factory floor, a station describes the force to strike a nickel as equivalent to the impact of 3 high-speed trains, the weight of 16 elephants or the combined bite strength of 157 great white sharks. You don’t really see much. The pressing action is blazing fast with up to 750 coins struck every minute. Everything’s downhill from there. New coins fall into a trap for inspection after which they are conveyed to get counted, weighed and bagged for eventual shipment to Federal Reserve Banks for placement into circulation. 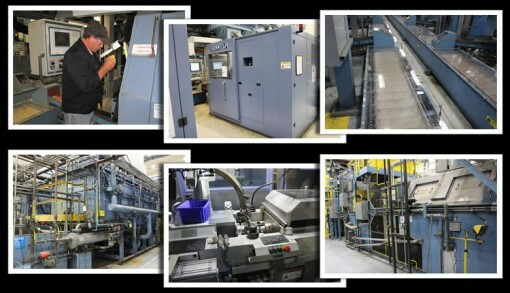 Here, a series of photos and videos show the production process in detail. In the first photo is a monster rack containing coils of metal that will be used to make blanks for coinage. The rack can hold up to 300 coils at a maximum of 10,000 pounds each. Coining Division. Coil Racking System. Racks of coil on the factory floor of the Philadelphia Mint. 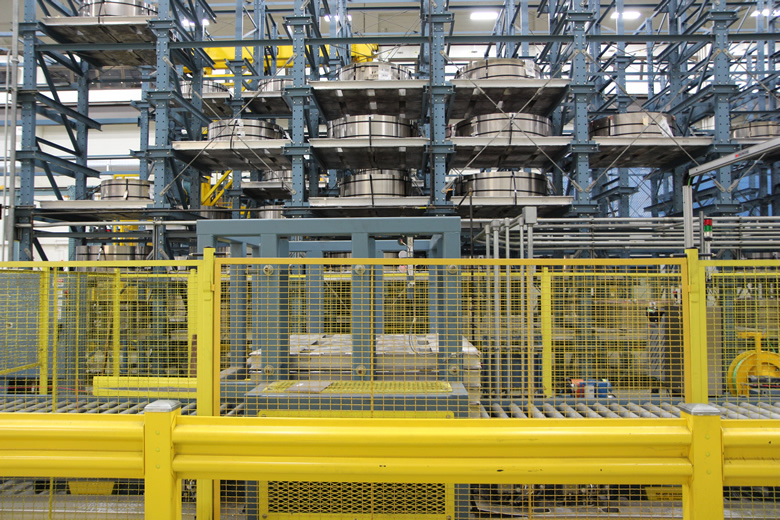 Coils are received at the Mint on aluminum pallets which support the coils in the racking system. 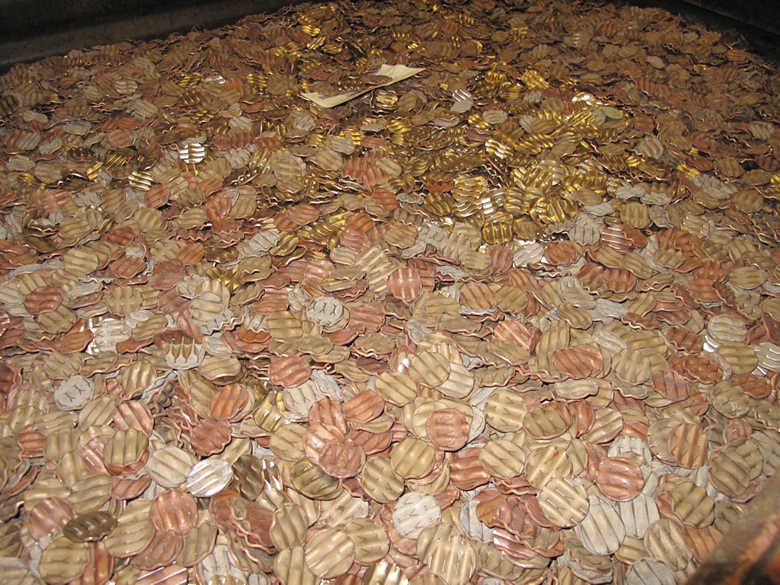 These coils are rolled up strips of flat metal from which coin blanks are punched. The strips are a bit wider than a foot and they are close in thickness to a coin. Each is 15,000 feet long, giving them a the length of five football fields. The Philadelphia Mint has a system that utilizes a computer database to automatically retrieve coils based on a request from the blanking press operator and dependent on the denomination to be pressed. A coil is hoisted onto a wheel that feeds into a blanking press. 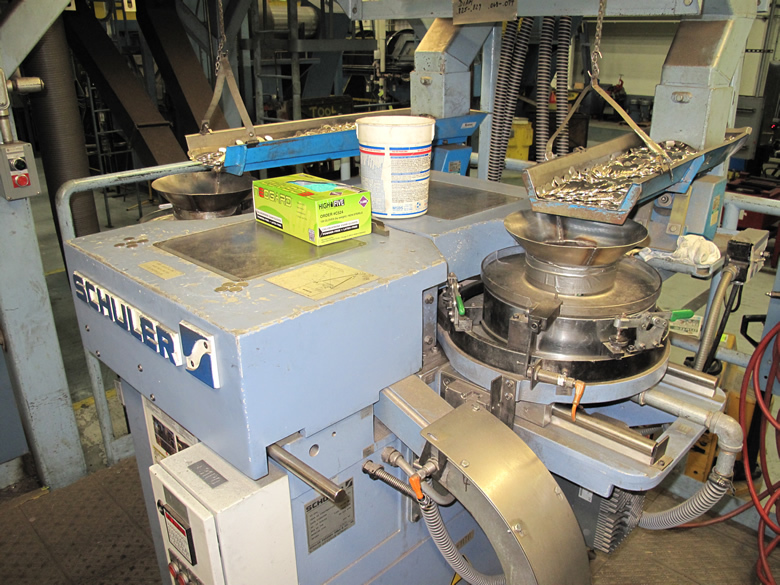 Blanking presses are like giant cookie-cutters. They punch out smooth metal discs, called blanks, from the sheets of metal fed through them. Left: A coil of metal that is fed into a blanking press. Middle: Cut coin blanks. Right: Leftover scraps called webbing. 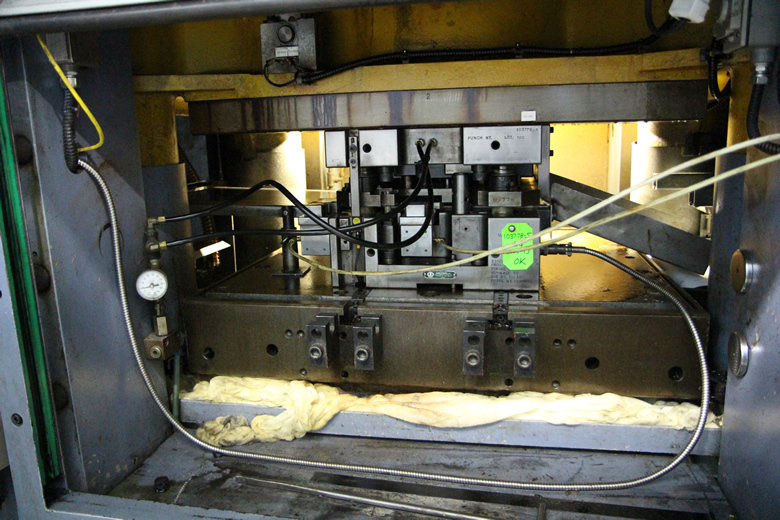 These sheets are fed between rows of dies which punch out the blanks using vertical force. Coining Division. Coil Webbing. Each bin of webbing is weighed and returned to the manufacturer where the scrap is recycled. 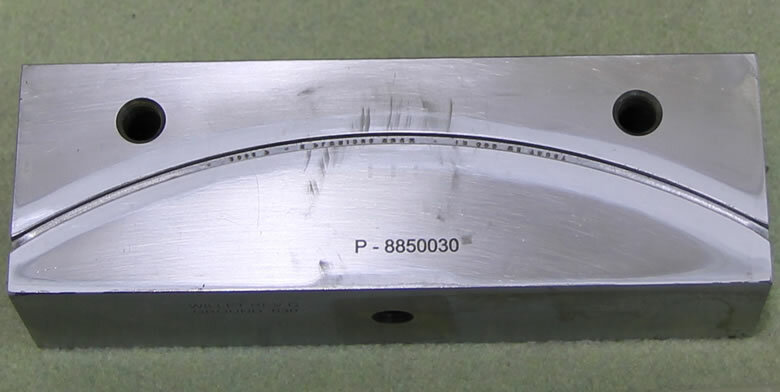 As part of the process, blanks cut in the first 12 seconds of start-up are always sent to a scrap tub. This prevents blanks with cutouts or flaws from continuing through the manufacturing process. Coining Division. Blanks in Red Condemned Tub. 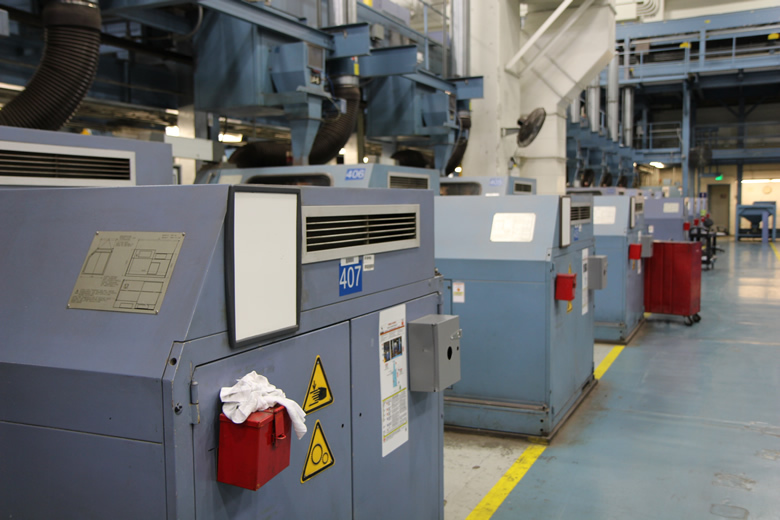 The first 12 seconds of blanks cut from a Blanking Press are always discarded. The Philadelphia Mint produces all of the coin blanks it needs to strike nickels, dimes, quarters, half-dollars and dollars (Presidential $1 Coins and Native American $1 Coins). It does not make cent blanks. These are outsourced with quantities arriving each day in large tubs. They are top filled and bottom discharged, and hold 850,000 blanks. Coining Division. Cent Blank Tubs. Cent blanks are not cut by the United States Mint. 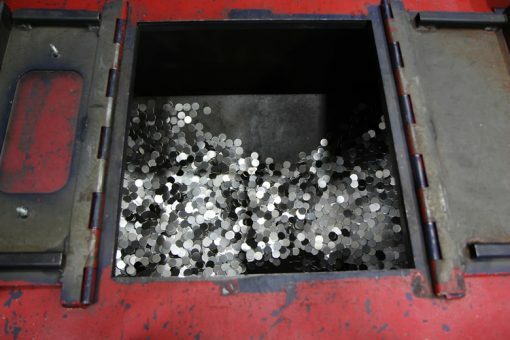 Pre-formed cent blanks are delivered to the Mint each day. The blanks are shipped in these Remcon plastic containers designed to work in the automated Penny Racking system. 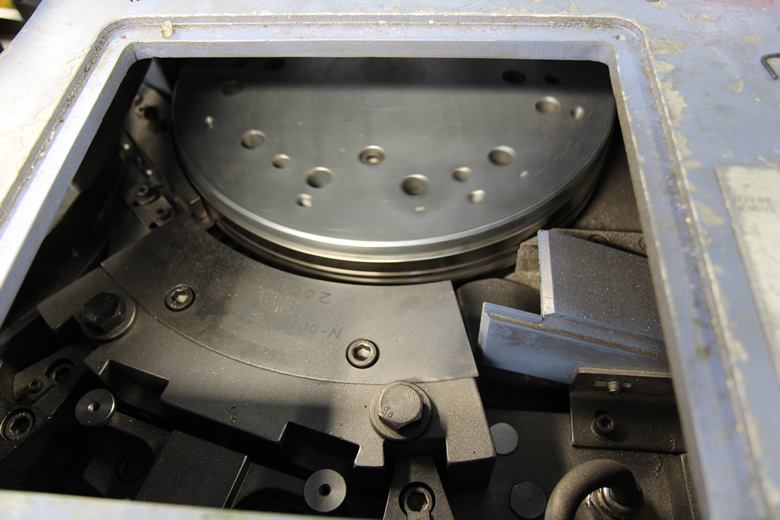 Before entering a Coining Press, blanks are processed through heating, cleaning and upsetting stages. 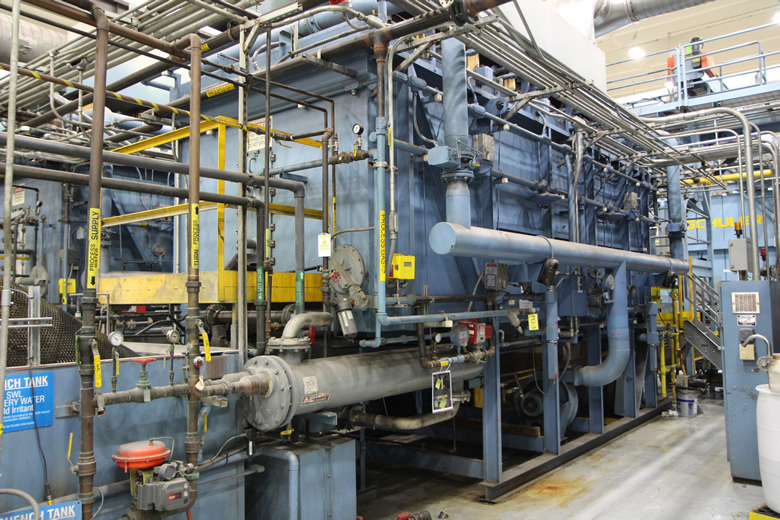 The first stage is to heat the metal blanks in extremely large annealing furnaces to both soften them and strengthen their internal structure. The furnace temperatures will vary depending upon the composition of the coin blank and resulting coin denomination. Coining Division. Annealing Furnace. After the blanks are cut from the coils of metal, they have to be processed. First, they are heated in giant furnaces which soften the metal. 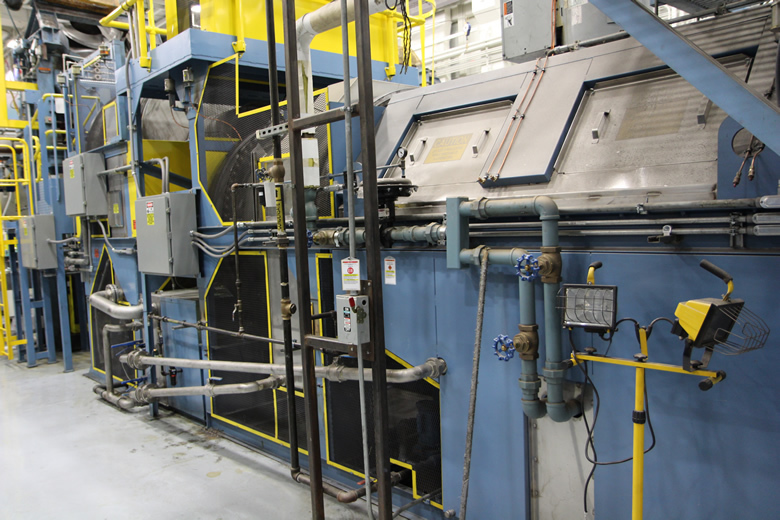 This Seco/Warwick furnaces can reach temperatures up to 900 degrees C. Each one can move about 3,000 pounds of blanks per hour. 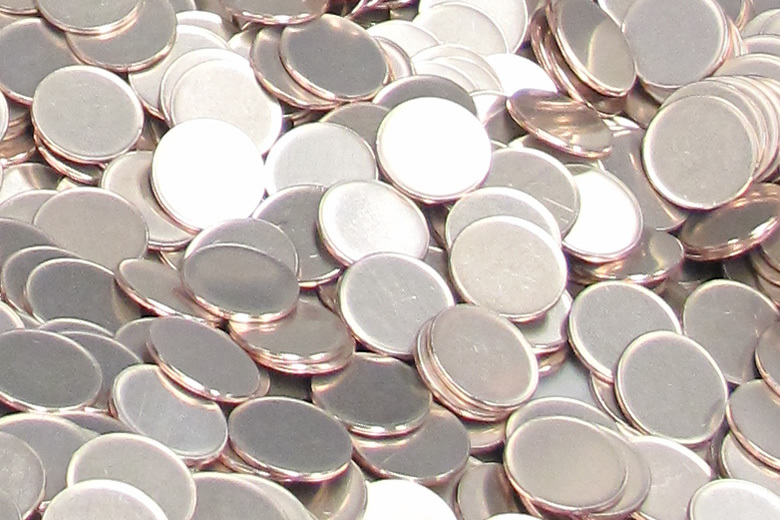 Blanks must be cooled down after their journey through an annealing surface. For that, they are automatically dropped into large quench tanks to reduce their temperature to 50 degrees C.
Coining Division. Seco/Warwick Quench Tank. 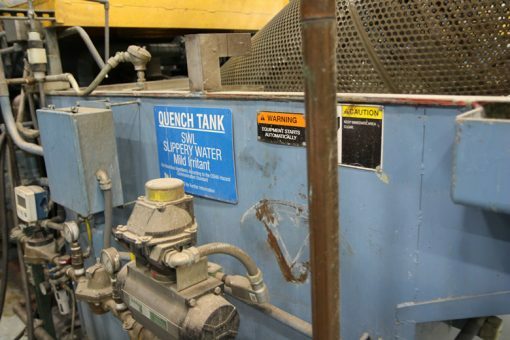 This quench tank cools the blanks to 50 degrees C.
Quench tanks are filled with water and a chemical "slippery water" that helps transport blanks through a whirlaway and into a washer and dryer. The whirlaway is a huge cylindrical tube that is suspended high above ground. Tilted at a 45-degree angle, it spins the blanks up, removes excess liquid, and dumps the blanks into a washer. This next photo of a whirlaway shows how it extends at a 45-degree angle. It represents about an eighth of the whirlaway’s actual length. Bottom portion of whirlaway. The whirlaway transports blanks from the quench tank to a washer. Placing blanks in high temperatures of an annealing furnace is a necessary step to produce coins for circulation but it also creates a grayish discoloration on the surface of the metal. 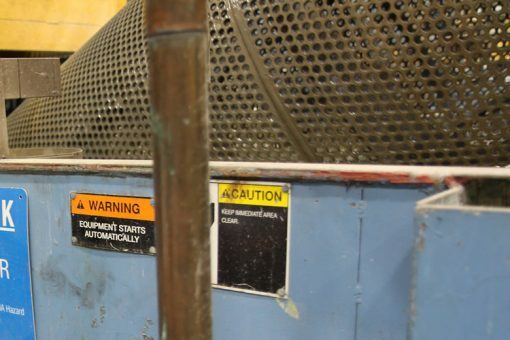 The washer dryer machines at the Philadelphia Mint, with one of them shown below, clean the blanks to a shine and then dry them. Chemicals are also applied at the washing step for brightness and anti-tarnishing. Coining Division. Washer Dryer. A whirlaway takes the blanks from the quench tank to the washer dryer. This barrel-type burnishing operation cleans the blanks, making them shine. Blanks are then sent to a rotary type dryer to remove all moisture. Now that the blanks have been heated, cooled, washed and dried, they must be upset. Upsetting is a milling process that raises the edge of each blank, bringing them one step closer to becoming a coin. The process both smoothens and hardens a blank’s edge. The newly created rims will be the highest point of the eventual coin, which will help protect their design and also allow multiple coins to be stacked. The following photos show the upsetting mill and several of its operating parts. 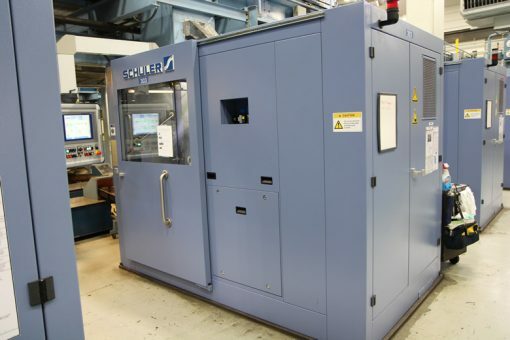 Schuler Upsetting Machine at Philadelphia Mint. 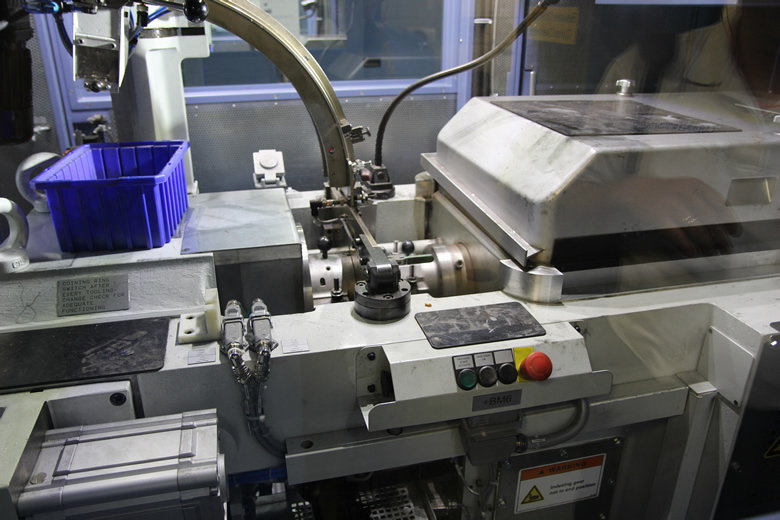 This machine places an edge or rim on blanks. Shown here are the vibrating feeder bowls for the upsetting mills. A closer view of the vibrating feeder bowls for the mills. Coining Division. Schuler Upsetting Machine. This spinning disc quickly forces blanks against a stationary segment which causes the edge to slightly rise. 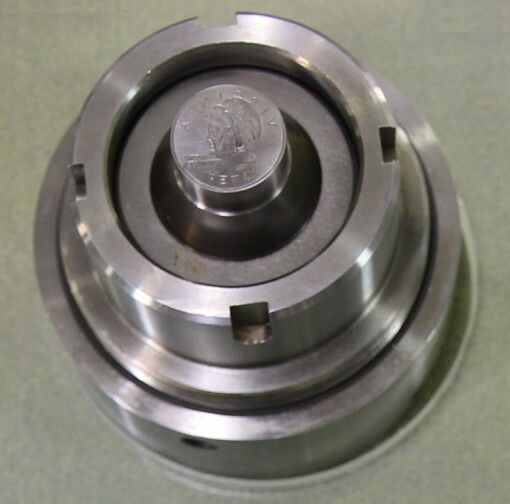 From a definition standpoint, coin blanks officially become "coin planchets" after running through an upsetting mill. As the photo below shows, the metal discs now have raised rims and they are ready for coin presses. Planchets created from blanks running through an upsetting mill. Notice these metals discs now have edges or rims. Coinage blanks arrive by conveyor and are automatically poured into the top of each coining press where they are fed between the obverse and reverse dies. With one strike, Schuler coining presses transfer the negative image from the dies onto the blank creating a coin. Each press can strike 12 coins per second. Coining Division. Coining Press. These are newer Schuler MRH 150 Coining Presses. The press and new sound enclosure represent a quantum leap in improved safety and ergonomics. Using 60 tons of pressure, this press can strike 750 quarters for circulation every minute. At the Philadelphia Mint, horizontal presses are used to strike coins for circulation. These means the obverse coin die, like the one below, and the reverse coin die lay horizontal. A blank is moved between them and gets pressed with 60 tons of pressure. An earlier article on CoinNews.net describes how the San Francisco Mint coin presses strike blanks with dies in vertical alignment. Finished obverse coin die in holder. This video of the inside of a press shows exactly how quick a blank between the dies get struck. Each back and forth movement produces a new quarter. The moving part holds an obverse die, like the one shown above. This photo shows a line of other presses used at the Philadelphia Mint to strike coins for circulation. 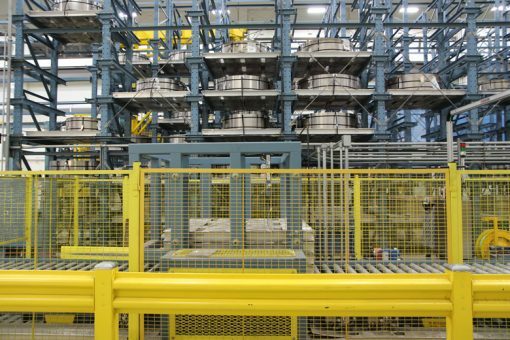 A section of one of the nine production lines with coining presses. Dollar coins are processed through an extra step. They are made using two stand-alone coining presses which are not on the production lines. After the dollar coins are struck, they are quickly fed through a RS 50 machine which places the edge lettering on each coin. A die segments, like the one below, are inside the machine. Each coin is rolled over the lettered-groove on the die segment at a pace of 1000 coins per minute. Finished coins for circulation pour from presses into a "trap" via a small belt type conveyor, like the one in this video. Here is a photo of the trap area. 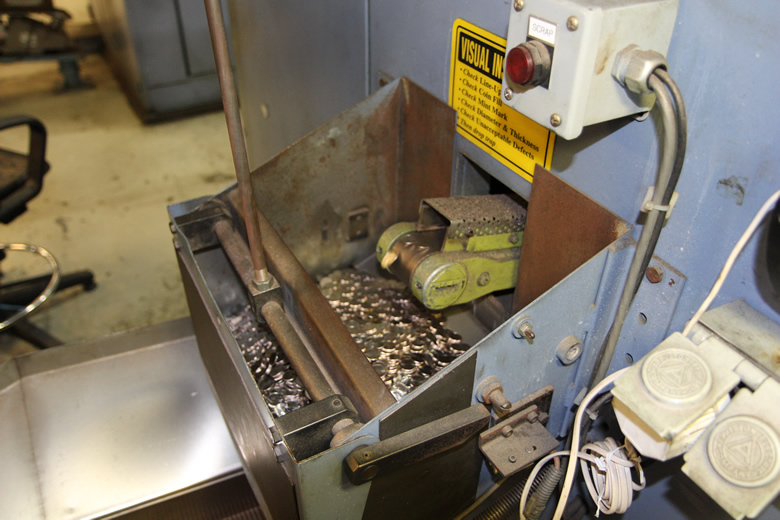 A Coin Press delivers finished coins to its holding box where they await inspection. When filled, the operator inspects the obverse and reverse of one of the coins to check for flaws. Coining Division. Coining Press. 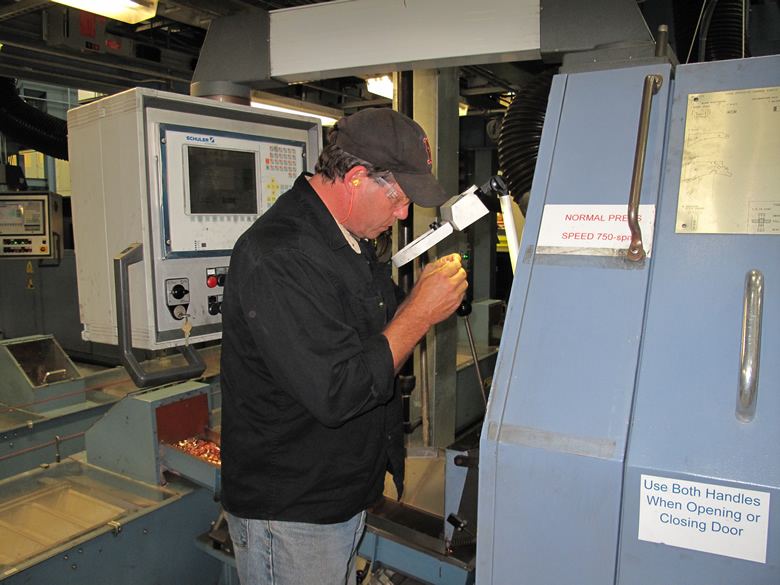 Robert Wasner, Metal Forming Machine Operator, inspects a new Lincoln Cent, still warm to the touch. If the coin has an error, all the coins in the trap are condemned. 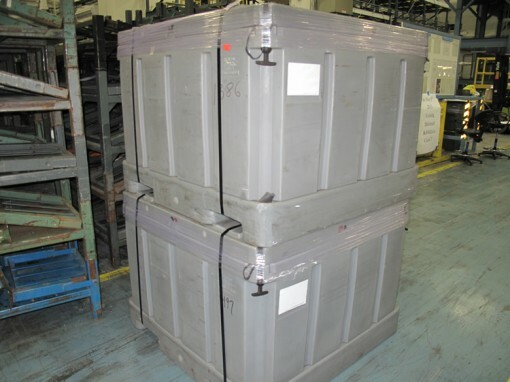 The condemned material is stored and eventually shipped to the metal manufacturer for recycling. An example of condemned product. These went through machines called wafflers. If the coin checks out, the machine operator pulls the trap’s lever and the coins drop onto a conveyor and travel to the counting and bagging area. 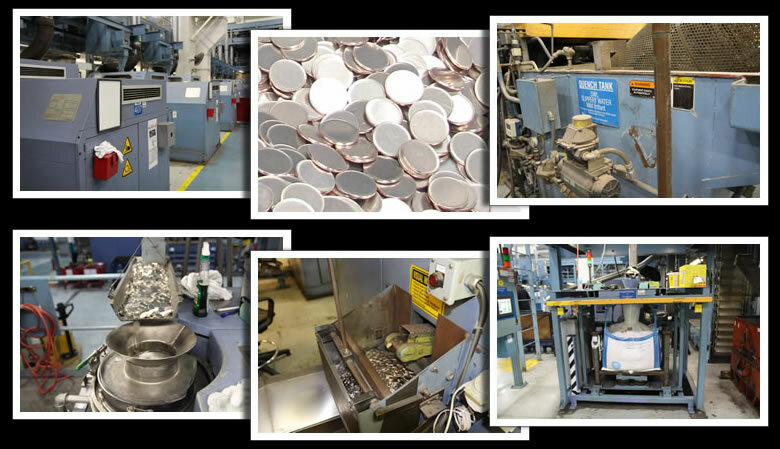 This video shows a small section of the more than one mile of conveyors used at the Philadelphia Mint. Here, a photo of the same area. 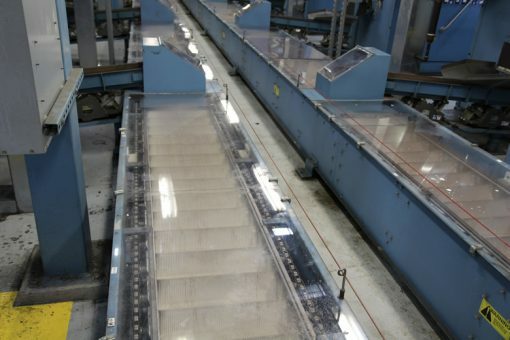 Conveyors moving coins on the factory floor of Philadelphia Mint. 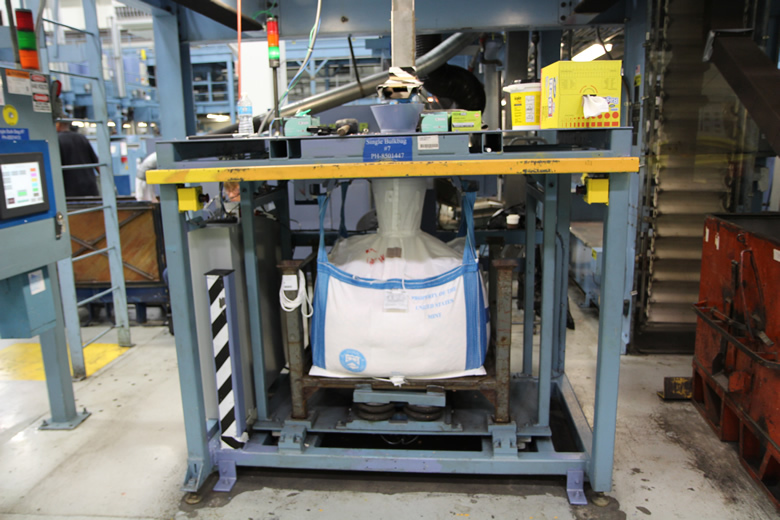 After struck in coining presses and inspected, coins travel by conveyor and are poured into plastic fiber, bulk bags. Cents are no longer counted but shipped by weight only. All other denominations are counted and weighed. This video shows cents dropped into a bulk bag. 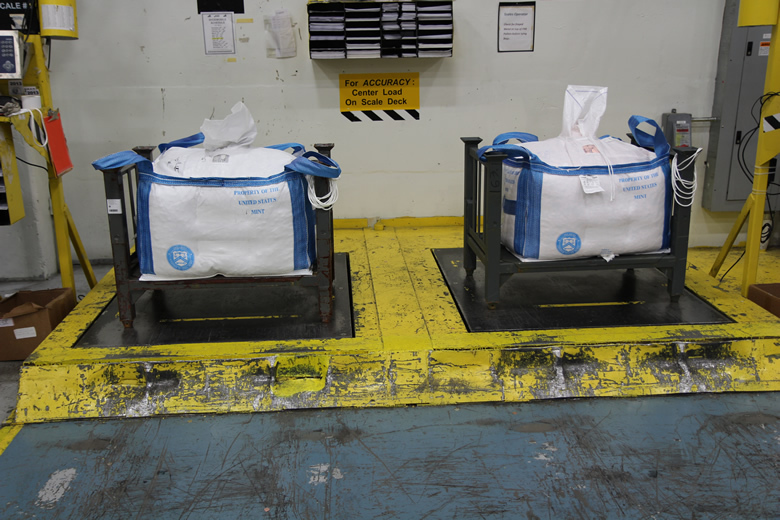 Here is a photo of the coins dropping into the Bulk Bag, and another with bags getting weighed. Coining Division. Bulk Bag Stand. When filled, this bag will weigh over one ton. 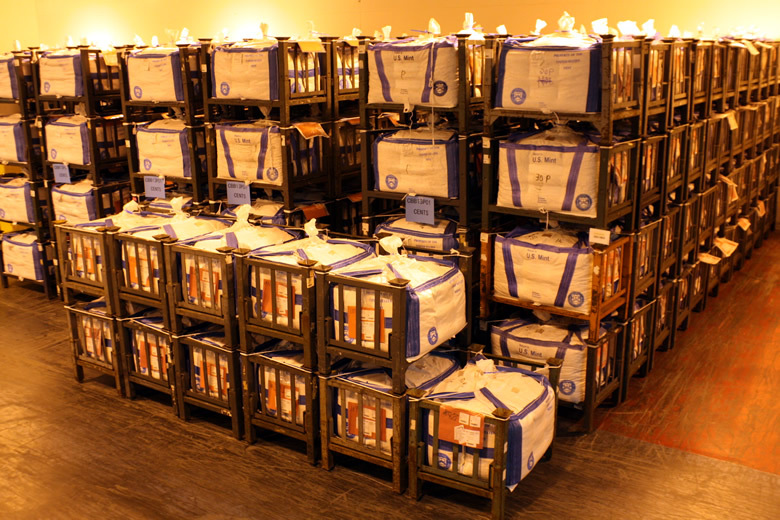 Bulk Bags of circulating-quality coins getting weighed at the Philadelphia Mint. After weighing, Bulk Bags of coins move to a storage area where they will await shipment to the nation’s Federal Reserve Banks. From there, they will make their way to financial institutions and then enter circulation. That’s it for this article. Thank you for visiting CoinNews.net and please come back again. Return Friday, September 27, for the next article in our several part series about the U.S. Mint at Philadelphia. It’ll focus on numismatic processes and products, including the making of bullion and collectible America the Beautiful Five Ounce Silver Coins. Wow! That is the single most informative article I have read about coin production Mike! Thank you so much, it is VERY much appreciated. So, let’s re-open the Mint and the Gift Shop, returning to the days and hours of pre-9/11 and allow the public full access to our U S Mint!!! These are great articles! Thank you. One small calculation error: 15,000 feet of coiled metal equals 50 football fields, not 5. (300ft x 50 = 15,000). Much more impressive.